Fri, Apr 12, 2019, 11:52 pm SL Time, ColomboPage News Desk, Sri Lanka. 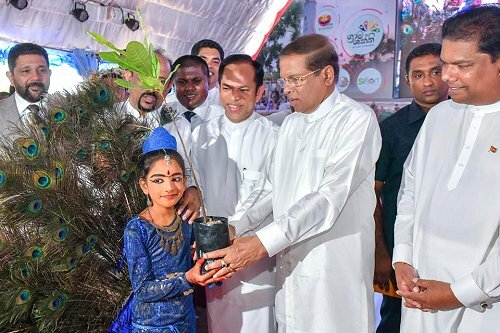 Apr 12, Colombo: Sri Lankan President Maithripala Sirisena has requested all the citizens of the island to plant a tree at the dawn of the Sinhala and Tamil New Year to fulfill their responsibility to conserve the environment. The President made this appeal addressing the concluding ceremony of the Rata Wenuwen Ekata Sitimu (Stand Together for the Country) national program held Friday (12) at the Weber Stadium in Batticaloa. He said the importance of environmental conservation today is recognized not just by our country but the entire world. The second phase of the program "Stay together for the country" was launched on the 8th of April targeting the Batticaloa district and various programs covering all the 14 Divisional secretariat divisions of the district were implemented under this program. There was a great deal of public participation in these programs. Implementing the national development projects led by the Presidential Secretariat under the direction and guidance of the President and implementing the National Development programs and social welfare programs efficiently and effectively to provide maximum public services and benefits to the people are the objectives of the program. This program will also identify issues of public issues that should be resolved from public institutions and work to resolve the issues with maximum efficiency through the state mechanism. A large number of programs were also launched during today's concluding session of the Rata Wenuwen Ekata Sitimu program under the patronage of the President. 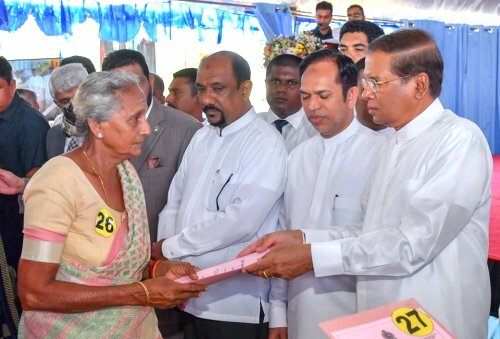 Five thousand coconut seedlings and 5000 cashew plants were distributed among the district's people and loans for self-employment for were handed over to selected families while war heroes received housing assistance. Other programs included handing over of school gear under the sustainable school development program, granting pensions to farmers, provision of financial assistance to places of religious worship, granting of utensils for hospital development, provision of drinking water and sanitary facilities. On the sidelines of these events, two children who were under probation care under the national program of protecting children were handed over to their parents. Expressing views on this occasion, President Maithripala Sirisena said that it has already been identified that illegal drugs were smuggled into the country on a large scale from the Eastern Province. The President said that he solicited the support of the people to further strengthen the raids carried out to overcome this situation. The President also expressed his satisfaction that the Presidential Task Force established for the development of the Northern and Eastern Provinces is currently implementing the development of the areas more efficiently and effectively. Minister Gayantha Karunatilaka and Eastern Province Governor A.L.M. Hizbullah also expressed their views on this occasion. Meanwhile the President opened the Batticaloa District Centre of the Smart Sri Lanka Vocational Guidance Network that opens the future doors to the youth. After unveiling the plaque the President inspected the Centre. Director General of the Smart Sri Lanka project, Eric Weerawardena also participated in the occasion.